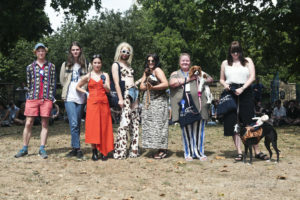 On a small field in Hackney Paddock, a group of people have formed a circle around a group of dogs and their owners, in the shadow of St John’s Church. However, instead of the vicar and maybe his wife – who is also the chairwoman of the local W.I. – judging the show, it’s members of Savages, Happyness and Blaenevon. A dog dressed as Vladimir Putin riding his horse wins. This is the opening gambit for Visions Festival, happening in and around Hackney and London Fields, at several venues scattered around E2 and E8 – a day’s worth of music, from up and coming Porridge Radio (pictured below) at the Sebright Arms to the toast of pretty much everyone, IDLES, headlining the dark, dank and sweaty bunker of Hangar. Visions is a parade of music, food, colour, light, beer and laughter up and down the main drag from Bethnal Green in the south to leafy London Fields in the north. Collect your wrist bands at Oval Space, traverse the railway arches and the edges of the River Lea, up the road following the brick raised rails to Space Courtyard, Hangar and LFB The Arches. Then there’s the Sebright Arms pub with its East End brick facade and stained glass; cold beers upstairs, a hotbox venue downstairs. I start at Oval Space, on the sun drenched balcony looking over the gasholders, now empty with their giant metal rib cage stretching into the bluest of skies. Inside the stark exhibition room Alaskalaska are opening up the day’s music. It’s pleasurable enough. A mix of Brand New Heavies and Zero 7 ambient grooves and sweet vocals. New single ‘Monster’ has a bit more fury with the lyrics clashing with the sax and looping guitar hooks. Sassy 009 unfortunately aren’t able to make their set, so Mellah step in at the last minute, but it was time to venture up to The Courtyard. With 45 minute turnarounds between acts it’s easy enough to check out the majority of what’s on offer without too many tough choices. The SPACE Courtyard was hosting a Super Bock beer garden, DJ stage, ping pong, GIF photo booth, “Visions” cross-stitch, T-shirt printing with designs by the likes of Hookworms, a plethora of street food from Mexican to Lebanese, tattooists playing a game of “roll the dice” to see what design the lucky (or unlucky) punter might get, and a Tarot Card reader for a “vision” (yep) into your future. DUDS then keep up the brass theme with an energetic set in the depths of Hangar, made darker by me forgetting to take my sunglasses off (mind the step). 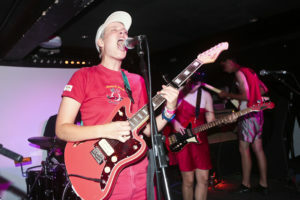 The band’s ska-punk and Castle Face experimentalism has a whiff of Ian Dury and the Blockheads. 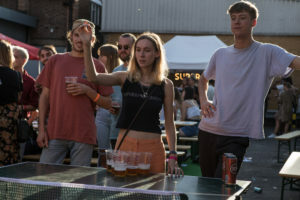 Blinking back the sun in search of shade in the beer garden, there’s fierce table tennis battles and fancy dress in all shapes and sizes. Sorry are as sly and special as always – Asha’s lip curls upwards with a mischievous smile as she sings. Their clever post punk, grunge and pop sensibilities are heavier and angrier than normal. They make a stupendous racket. It’s a tempo change back at Oval Space for the glorious Nilufer Yanya; a heady concoction of lo-fi sound with husky voice that borrows from soul as much as indie. It’s a blissful comedown from the hectic shenanigans up the road and an appreciated blast of air-con away from the low ceiling and sticky bodies in the Hangar bunker. Marika Hackman and band are plagued with technical problems as they soundcheck but once underway she is a force of nature that is up a notch from her records, which range from folk-tinged acoustic and indie pop. ‘Boyfriend’ and ‘Blahblahblah’, from last year’s ‘I’m Not Your Man’ LP, bring things to a ferocious climax. 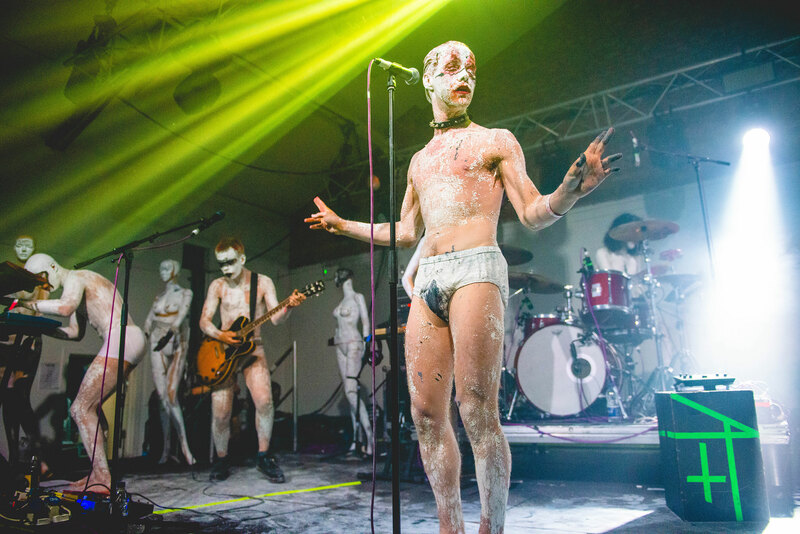 Stage left, behind double-doors, it is possible to see HMLTD, stripped half naked and getting covered in white body paint. They are clearly going all out for this headline show. News is filtering down that well before IDLES are due on that it’s one in/one out at Hangar, so I’m staying put to bare witness to the theatrical performance that is the London collective’s live show – sinister entrance music, mannequins silhouettes, flickering white light and what appears to be The Crow hovering mid-air. The band launch into ‘Proxy Love’ as frontman Henry Spychalsk channels Brett Anderson via Adam Ant. It’s all camp glamour and ear-bleeding breakdowns; Frankie Goes to Hollywood and Visage meeting with the the stage presence of a West End. It’s impossible to keep your eyes off. Then into the night. Beer Pong with Sorry (below) missed earlier. Wrong place, wrong time. To next year. The vision indelibly burnt into the mind. Visions Festival @ various east London venues, Saturday 4 August 2018.